As I am back for another semester of uni, we decided to go for lunch at Tra Vinh on Brisbane Street before my lecture at 4pm. Tra Vinh remains as one of my favourite Vietnamese restaurants because they serve authentic Vietnamese dishes which reminds me of the food I had in Ho Chi Minh City three years ago. 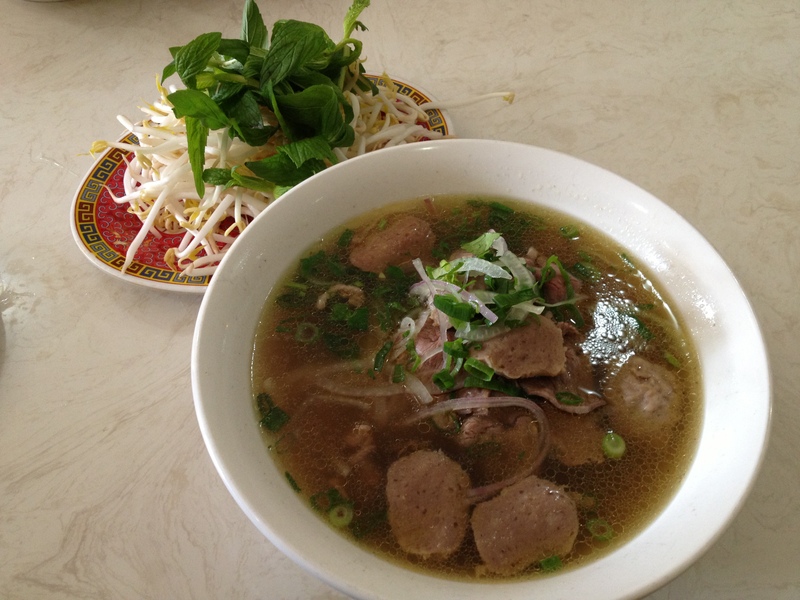 Tra Vinh offers a variety of noodle soup and rice dishes at a reasonable price. It has been a while since I last dined at the Brisbane Street restaurant and recently they have opened another branch on William Street. The interior at Tra Vinh looks very different and fresh from the last time I came as the chairs and tables seem new. When we were seated, we were given a thermos containing hot tea and menus. 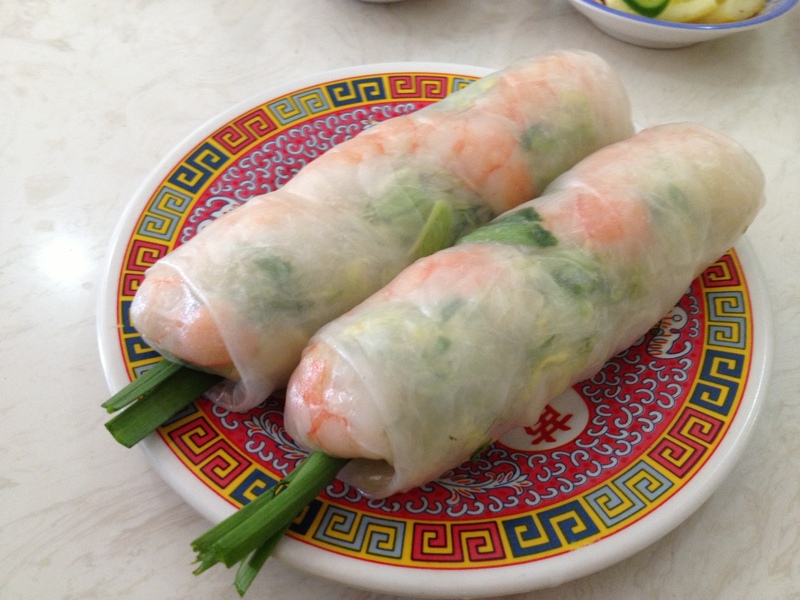 We ordered the Rice Paper roll with Prawn ($4.50) to share. The rice paper roll was fresh and delicious. It was wrapped perfectly which held all the ingredients in the rice paper roll together. Dad and I ordered the Raw Beef and Beef Ball Hofun Soup ($11) which came with a plate of beansprouts, mint leaves and lemon. The Raw Beef and Beef Ball Hofun Soup was generous in portion and adding lemon and mint leaves gives a fresh taste to the dish. The Hofun noodles were very soft and was cooked to perfection. I nearly drank the whole bowl of soup as it was tasty and full of flavour. 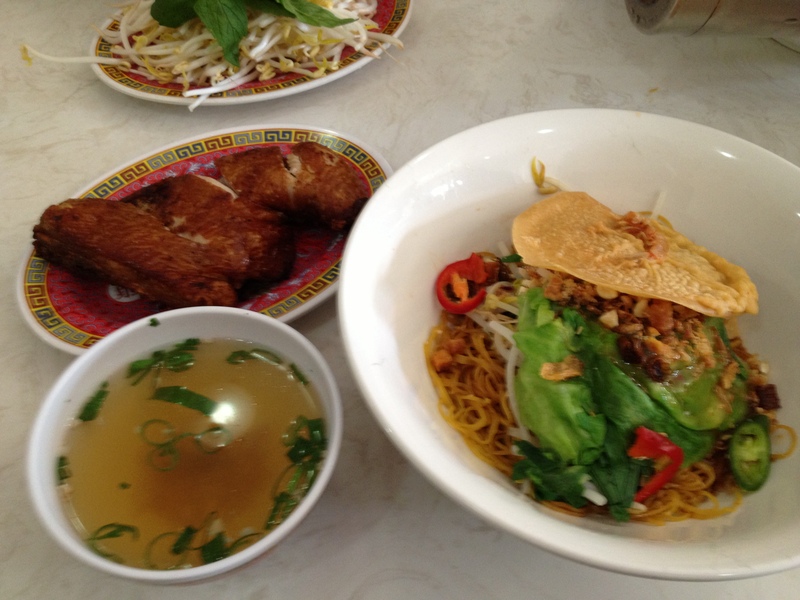 Mum ordered the Egg Noodle with Crispy Fried Chicken ($11.50) which comes with a small bowl of clear soup. I tried a piece of the crispy fried chicken and it was crispy and finger lickin’ good! According to mum, the egg noodles were perfectly cooked and the crispy fried chicken complements the noodles well. Overall, we enjoyed our lunch at Tra Vinh and I was quite full which is great, so that I won’t feel hungry halfway through my lecture in the afternoon. From the ratings on Urbanspoon and word of mouth, Tra Vinh is one of the most popular Vietnamese restaurants around Perth. Why? Because they serve value for money and yummy food.